Red ceramic pan with a black interior. 2 qt. capacity. 2.5 qt. blue ceramic pan with Edelweiss flower accents. Black ceramic pan with Edelweiss flowers design. 2.5 qt. capacity. 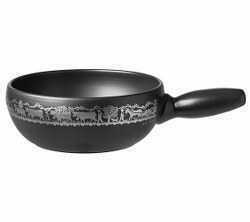 White ceramic pan with a black interior, Heidi Alpine scene artwork. 2.5 qt. capacity. Cream colored ceramic pan, winter cabin Alpine scene. 2.8 qt. capacity.